Sahib and the Crew Save the World: The Race Card Is The Real "Last Refuge of a Scoundrel"
The Race Card Is The Real "Last Refuge of a Scoundrel"
Which of the following issues is the real reason that Obama Attorney General Eric Holder is under fire from the right? Choose all that apply. Holder's involvement in the Clinton Admininistration's last minute pardon of Democrat contributor and fugitive tax evader Marc Rich. Holder recommended clemency for 16 members of the terrorist organizations FALN and Machateros as Clinton's Deputy Attorney General in 1999. In 2008, Holder urged the Supreme Court to uphold the unconstitutional Washington DC handgun ban in D.C. v Heller, claiming that the Second Amendment does not protect an individual's right to keep and bear arms outside of a state run militia. Holder gave a speech on February 18th, 2009 in which he proclaimed "the United States is a nation of cowards" when it comes to racial relations. In November of 2009, Holder announced plans to bring 9/11 conspirators to New York for trial in the U.S. criminal court system. 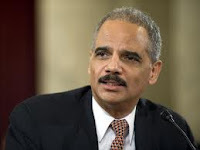 Agents of Mr. Holder's Department of Justice supplied weapons to drug traffickers, weapons that have been used in hundreds of violent crimes, including the December 2010 murder of U.S. Border Patrol Agent Brian Terry. He's sueing the state of Arizona because they dare to try and take action against the overwhelming flood of illegal immigration that the Obama Administration has failed to address. He opposes any attempts to reduce voter fraud through voter ID measures. In the interview, Mr. Holder offered a glimpse of how he viewed the criticism. He said he thought some critics — like Senator Lindsey Graham, a South Carolina Republican who favors allowing the military to handle terrorism suspects over the criminal justice system — are expressing “good faith” arguments about their policy disagreements. But Mr. Holder contended that many of his other critics — not only elected Republicans but also a broader universe of conservative commentators and bloggers — were instead playing “Washington gotcha” games, portraying them as frequently “conflating things, conveniently leaving some stuff out, construing things to make it seem not quite what it was” to paint him and other department figures in the worst possible light. 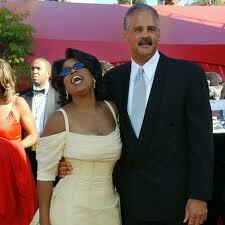 Is it Stedman, is it the Attorney General? I don't think even Oprah knows for sure! Yep, you're right Mr. Holder. All us crackers out here would be just fine with items 1-9 on the above list, if only you were white. In the fine tradition of Al Sharpton, Jesse Jackson, and Cornel West, Attorney General Holder is carving out a place of his own in the race-baiter hall of fame. Do us all a favor, resign your office immediately and go back to just squiring Oprah around town.